Converts Brianna from \"The Family\" into a companion with voice and lip synced dialog. Note: If upgrading from any previous version of Brianna Companion you MUST follow the upgrade instructions located towards the end of this description. Keep in mind that other mods can conflict with Brianna Companion which is no fault of this mod and make sure you read the FAQ section. The "Jacuzzi Fun" screenshot of Brianna illustrates she can wear custom clothes, it was taken in the jacuzzi of the Mini Hideout - Player Home by Rayek wearing the Wasteland Seductress outfit by Bronson (http://www.fallout3nexus.com/downloads/file.php?id=4886). While working on Lucy West Companion I came up with the idea of "what if the method you used to hire a companion impacted upon their features?". So once Lucy West Companion 1.4 was finished I began developing Brianna Companion with that idea in mind. So what does this mod do exactly? Well it converts Brianna from "The Family" into a companion with voice and lip synced dialog. She can be hired at any time with either the Cannibalism or Hematophage perk, but heres the fun part, you get to decide whether you get "Cannibal Brianna" or "Vampire Brianna" based on which perk you hire her with! - Tag skills are Melee, Small Guns and Stealth. Overall I'd say the cannibal version is slightly better in damage and profitability but I thought that was necessary given the player must choose the cannibal perk manually, while everyone has access to the vampire version. Currently she doesn't have any idle chatter when following you on your travels, I prefer the "easy on the ears" option now days. Q. Hematophage perk? What the hell is that? A. This is a perk awarded to you by completing the quest "Blood Ties" and then returning to Vance and asking him to teach you the ways of a vampire. It is available to all characters who complete "Blood Ties". Q. Brianna gets annoyed when I steal stuff from The Family, what gives? A. She is still friendly with The Family so I'd steal everything you want before hiring her. Q. The Cannibal quest asks me to talk to Vance but the dialogue option wont appear. A. This happens when you hire Brianna with the Cannibal Perk before talking to Vance, he just needs to introduce himself first so run through all the dialogue he gives, it will finish, conversation will end, talk to him again and you'll have the dialogue option. Q. I've unlocked harvesting via the questline, removed the unlimited ammo weapon and set her to melee combat but sometimes the harvested item doesn't appear in her inventory. What gives? A. This usually happens when Brianna takes a lot of damage during a fight, the vampire version will drink the harvested blood pack and the cannibal version will eat the strange meat to regen some health. 1. Load old version of Brianna Companion and remove all items you want to keep from Brianna. 2. Fire Brianna and save the game. 3. Exit fallout 3 and uninstall Brianna Companion as per instructions below. 4. Start fallout 3 without any version of BriannaCompanion and load your previously saved game. 6. Download new version of Brianna Companion and follow install instructions above. 7. 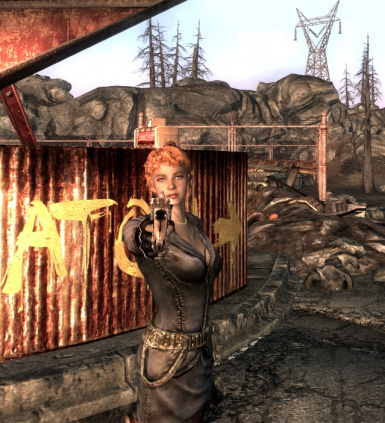 Start fallout 3, reload your save and hire Brianna.